Brighton & Hove Albion have completed the signing of Almeria striker Leonardo Ulloa for an undisclosed fee, believed to be around £2m. The 26-year-old Argentine has signed a four-and-a-half year contract with the Championship club. Seagulls boss Gus Poyet told the club website: "Leo is that striker we have been looking to add for some time. "He will complement our existing strikers and enjoy playing with our wingers and creative players." Ulloa, who scored 29 goals for the Spanish second division side last season, recently obtained a Spanish passport which enables him to play in England. He flew Sussex at the weekend for talks with Albion and attended their 2-1 win over Derby County on Saturday. Poyet continued: "He's a typical number nine box player. "He's good in the air, he will hold the ball up and he has good movement around the box when the ball is wide. "He will fit in well to our identity and I am sure he will make us a stronger team." And the Brighton boss says he has been monitoring Ulloa for some time. "I know him from Argentina and I follow Spanish football closely so I have been aware of him for a while. "The problem was that he was not available because he didn't have a European passport. "However that situation has changed since the last transfer window. "As soon as we knew there was a chance of getting the passport sorted, the recruitment system moved very quickly." 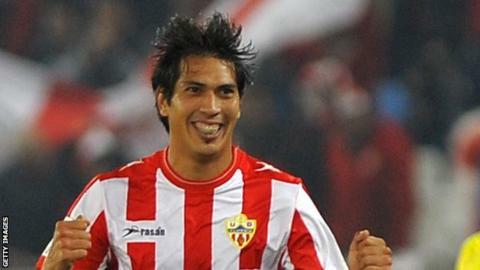 In total Ulloa scored 48 goals in 102 appearances for Almeria after joining the club from Castellon in 2010. He will only be available for Brighton's league match at Birmingham City on Saturday when he receives international clearance.